by its aesthetically pleasing cover, by the theme of female friendship and by the Australian setting (and not necessarily in that order). I have read Jane Harper’s The Dry earlier this year, and I was curious to read more Australian writers. They seem to have quite a different voice from the mainstream American-British literature I’m used to. Which sounds pretty naive from me, I know, but I’m a complete ignoramus when it comes to Australia. I loved the book, although it started slow and took its time to get to the main point of tension. But provided you’re not in a big hurry (in which case a more classic thriller would be more suitable), there are many things to enjoy in this novel. 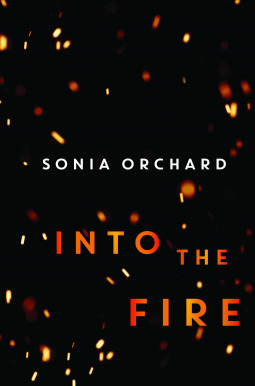 “Into the fire” chronicles the slow evolution of a friendship during two decades between two women, Alice and Lara, who met at university. It’s probably a universal sentiment to have had deep friendships loose their intensity as people grow older and grow apart. The point that Sonia Orchard adds to this classic mix is that Alice and Lara had strong feminist ideals when they met, which united them, and Orchard dissects how life make these ideals a lot murkier when confronted with motherhood, marriage, work and partner choices. Lara has been in awe of Alice because of her independence and strong voice. She is surprised and upset when her best friend falls for a charming musician, gets pregnant and moves to the countryside to raise their kids. There is also a strong element of mystery, but the friendship (and subsequent betrayal thereof) was what interested most. Lara is an unreliable narrator who is not completely sympathetic, but I could understand her and relate to her sadness and regrets.